Mount Pleasant Granary - Tuesday 9th. December, 2014 – Getting on with it! There is quite a difference since yesterday and I am really pleased. Mind you, we will be relying on the services of a really good plasterer to cover up our defects but we won’t be the first to do that! Rose, walked Mix and breakfasted in time to be ready for Neil who was coming to help me with the plaster boarding in the Hen House. He was fabulous and we achieved a great deal, working around the window in the main upstairs room before we stopped for coffee and then, after we had lunched with Tom (who had been in England collecting his car) we completed the east wall. 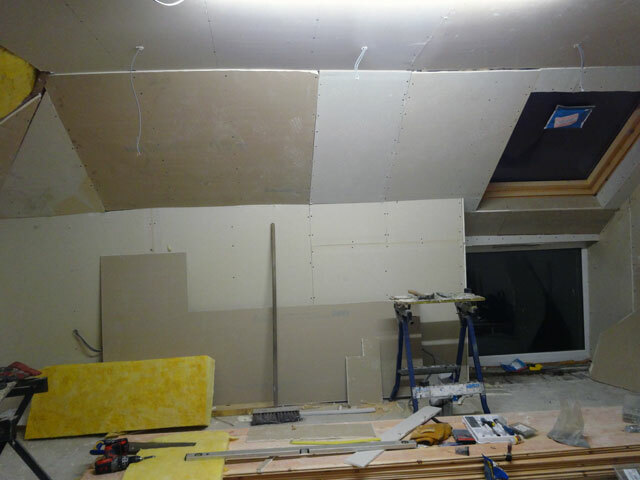 Tomorrow we will have the whole squad – Neil, Tom, David and me – and we hope to complete the plaster boarding of that room. It will be quite an achievement. Mind you, we intend to go to the church lunch so we may not get as much done as we expect. David also arrived this afternoon (he had been in Edinburgh today) and he drove me into Duns to collect Rachel’s Bongo which had successfully gone through its MOT test. Also today, Mum had visited the hairdresser, Rachel had gone shopping in Berwick, Sandy had arrived and done some more work on the loom, Olive had helped Rachel complete her tax return and Digger had been working on his bookcase. We all dined together in the farmhouse while all around the winds grew in intensity. I have had to tie the rubber dinghy to my car to prevent it being blown away (the dinghy that is). After supper we retired to our lovely warm Granary and relaxed in front of the fire before I took advantage again of an early night. I think that I am making progress with my cold – but it has not been beaten yet. Walking Mix this morning, a car stopped and a lady driving said that she was sorry she hadn’t seen me walking Mix recently. (I was delayed today because of a delivery of concrete slabs from Pearsons.) She said that I reminded her of Father Christmas being towed along by my faithful reindeer. Well, I expect that there are worse people to be taken for (although Mix isn't sure about being taken for a reindeer).